For our multi-year contracts we will visit your property, as weather allows, several times throughout the winter months. 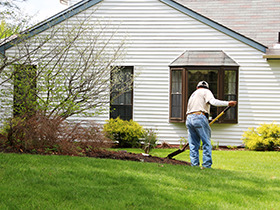 If your property is being maintained by Levanduski's it will start the very early spring already in good shape. The year starts with a general clean-up of the property, all trash, branches, leaves and debris are removed from the property. Parking lot corners are clean and the attention to detail is evident. A variety of mulches are available from the more natural root mulch made from ground stumps and branches to the color enhanced products in a variety of colors. Properly installed, mulch will not only beautify the property it will protect the plant roots and suppress weed growth. Mowing, string line trimming, sidewalk edging. Proper execution of the weekly service leaves your property clean of debris, with sharp clean edges, and the look that a professional service has been to your property. Pruning and trimming of plants and trees; this is done with the species in mind. This is where our training really kicks in. Properly pruning plants according to the species will keep the plant healthy and looking good for years to come. We approach each plant with the proper tools. If hand pruning is requires we do what it takes to keep the value of your plant investment at it's optimum. Often properties require several visits to get this right, we'll be there for you. Starting in September we will be removing fallen leaves with each service visit. As the fall progresses our October and November visits become bi-weekly, we will vacuum all leaves and remove them to be properly composted. A last visit usually comes in early December to get those Oak and Pear leaves that like to hang in there. A little science goes a long way. We believe in soil testing and the utilization of the information to optimize the applications. No guess work here, we know beyond any doubt what the soil needs and that the best way to grow great turf is from the ground up. Apply a pre-emergent weed control. This application will suppress the germination of a broad spectrum of weeds the most notable of those is crabgrass. Apply a broad spectrum weed control to rid the turf of those cold germinating weeds like chickweed that are there early. Apply a second pre-emergent weed control in combination with a balanced fertilizer. Apply a broadleaf weed control. Apply a balanced fertilizer according to the soil analysis. Apply broadleaf weed controls to keep the property clear of fall germinating weeds. We take great pride in all of our work. As the owner I am particularly proud of our snow division. The great lengths that so many of our guys go to, employees and sub-contractors alike, to be ready to go and to stay the course. Always there for our Customers at a moment's notice. Foregoing winter vacations or time off to be here when needed. That's dedication. This is another area where the training shows. 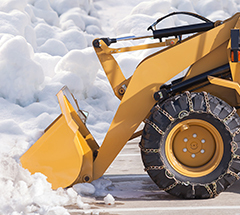 Good snow removal starts with a plan, a thorough evaluation of a property. 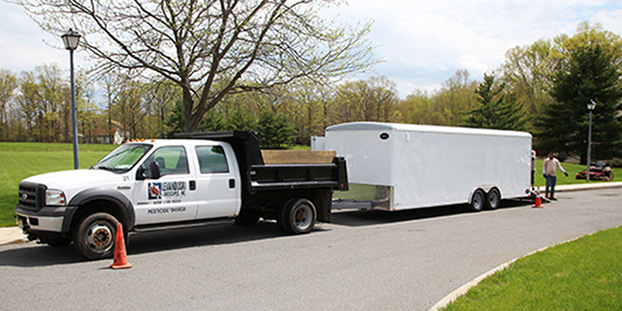 We will provide properly trained people with equipment that is ready. Proper planning, preparation and execution that is the difference. We offer many property enhancement options from drainage improvements to landscape design, to tree and shrub replacement. Concrete work, hardscape projects, new landscaping all of your needs from one source, Levanduski Landscapes Inc.